This is the sixth article in a series detailing the 684 kilometre Route des Grandes Alpes. A great cyclo-tourist route through the French Alps, over 16 mountain passes, on a road linking Lake Geneva (Lac Léman) to the Mediterranean Sea. The main goal of these articles is to highlight alternate route options and interesting detours. Regardless, below I will outline your three options. I could happily recommend all three. Built in the early 1900’s, the first of the stage’s two climbs – Col de la Cayolle (2326 metres) – is not the most difficult, but it’s almost 30 kms long. Almost immediately scenic, it climbs through the lovely Gorges du Bachelard. Perhaps the most spectacular part of the climb is the top of the south side of Cayolle with great hairpins and cliff stretches. Unfortunately no pics, but very fun. Starting in Guillaumes, the second big climb of the day is to Col de Valberg (1668 metres). I have never cycled this road. But it climbs at a very steady 7% or so, has plenty of hairpins, and is supposed to be quite scenic. Finally, after a brief descent to Beuil, the route climbs the easiest side of Col de Couillole – just 8 kms at 3.5% average. People rave about this stretch of road. Note, there are other two huge (and interesting) sides to Col de Couillole: 1) from the east – the way this stage now descends is 16 kms @ 7.5% to the finish at St-Sauveur-sur-Tinée. 2) From the south – starting in Pont de Cians is over 29 kilometres long (including the 8 kms from Beuil). 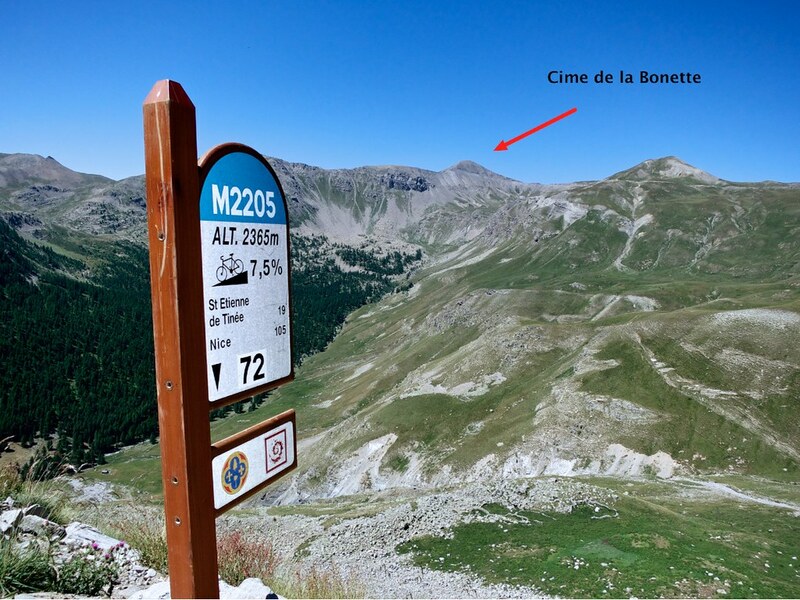 This detour takes a completely different route to St-Sauveur-sur-Tinée, via Cime de la Bonette. 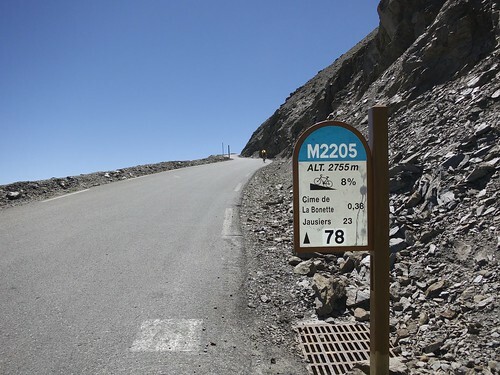 At 2802 metres, it is the highest paved road in France, and one of the very highest in Europe. 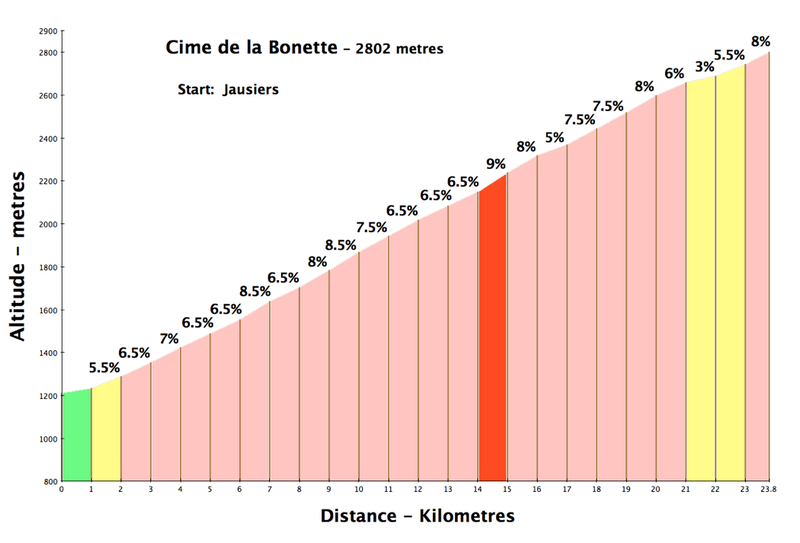 Note, the Col de la Bonette is just below the Cime, at 2715 metres, but the competitive engineers added a little loop starting/ending at the Col that goes up and around the mountain, to get higher than Col de l’Iseran (2764 metres). 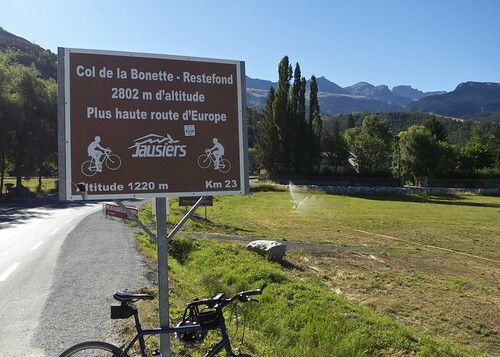 There are plenty of road signs – incorrectly – claiming Bonette to be the highest road in Europe (see small photo above). Photo below: Col de la Bonette in foreground, the road goes around that ugly mass, with the Cime high-point on the far side. If you haven’t cycled it before it’s tough to pass up this alternate, super-high route. Fair enough. 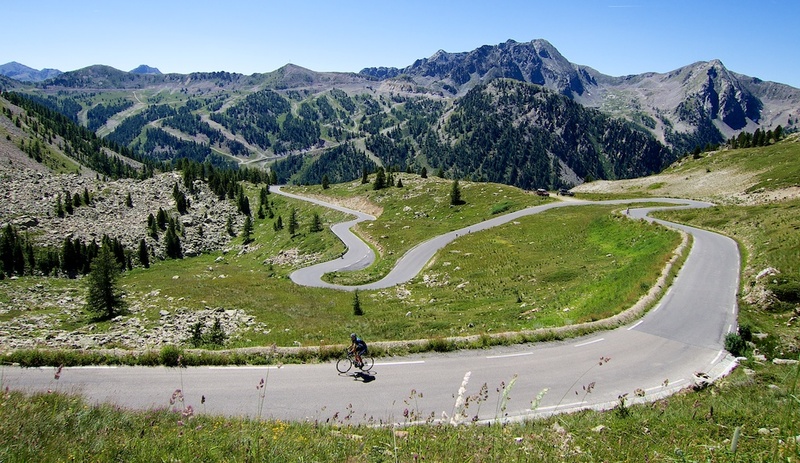 As I mentioned in the previous post, arguably the best loop in the south French Alps is Col d’Allos – Col des Champs – Col de la Cayolle (details here). This second detour skips Col de la Cayolle, instead climbing the best (north) side of Col d’Allos, then the remote Col des Champs, before rejoining the official Route des Grandes Alpes to climb Col de Valberg and Col de Couillole. 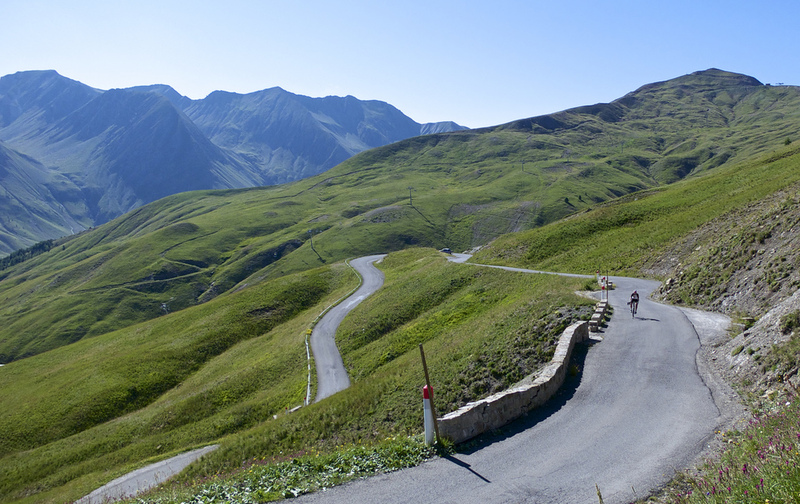 It’s the longest, and toughest of the three options, but you get two superb, huge cols. 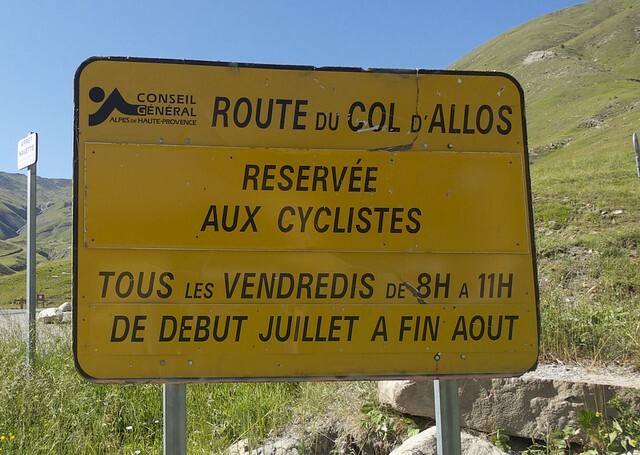 In summer, the south side of Col d’Allos is closed to motor vehicles every Friday morning. Nice! Which Option Do I Recommend? 1. Col d’Allos/Col des Champs detour – Beautiful and quiet roads, and unlike the Bonette option, this route still climbs Valberg and Col de Couillole. However, this is a tougher stage. On a long tour it may be too much for some. 2. 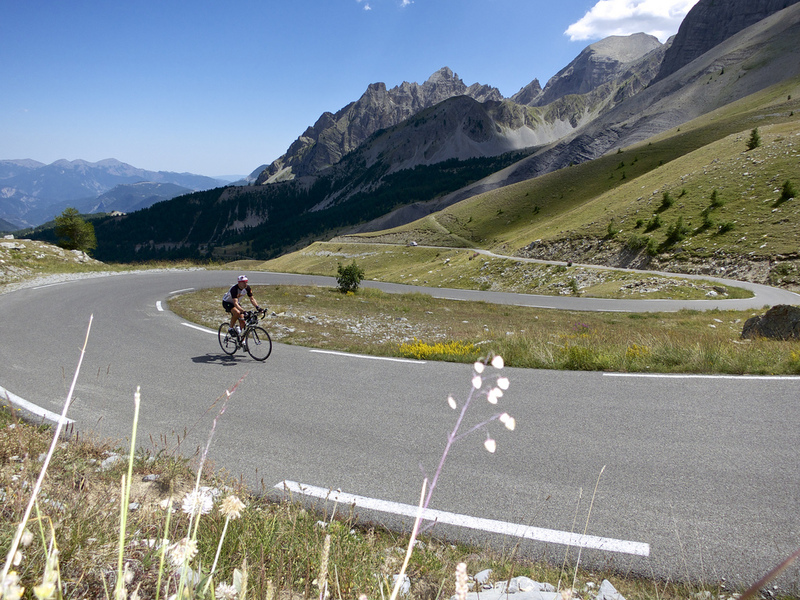 Cime de la Bonette – It’s tough to pass up one of the highest roads in Europe. I understand. It might be my first choice if I’d never climbed it. 3. 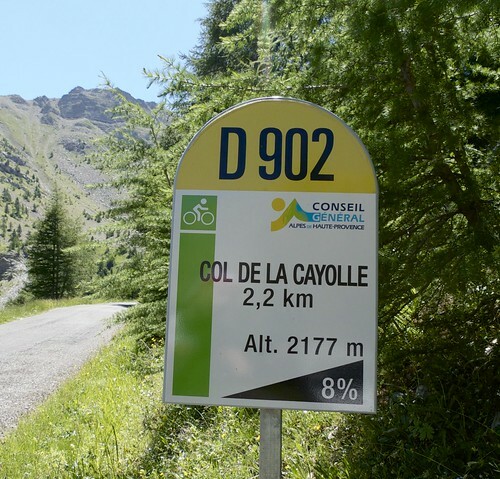 Col de la Cayolle – Yes, the official route would be my third choice. Again, it’s lovely. If you’re a purist and want to stay on the official route, no harm done. 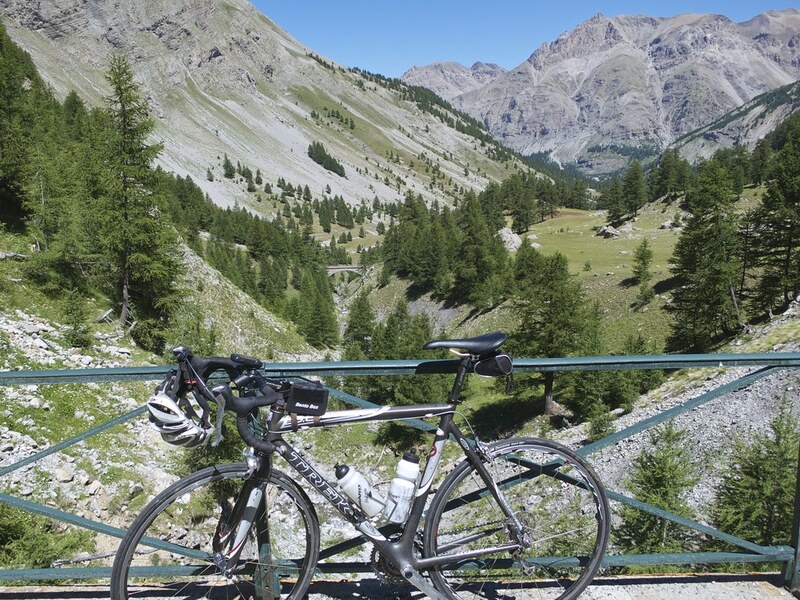 I should mention that my brave wife Doreen has cycled all three of Cayolle, Allos, and Bonette. 1. While descending Col d’Allos, near the town of Allos, is a turn off to Lac d’Allos (2127 metres). Supposed to be beautiful. Relatively challenging. 2. Below Col de la Bonette, but only paved on the south side, is Col de la Moutière (2454 metres), the 5th highest paved pass in France. Details here. 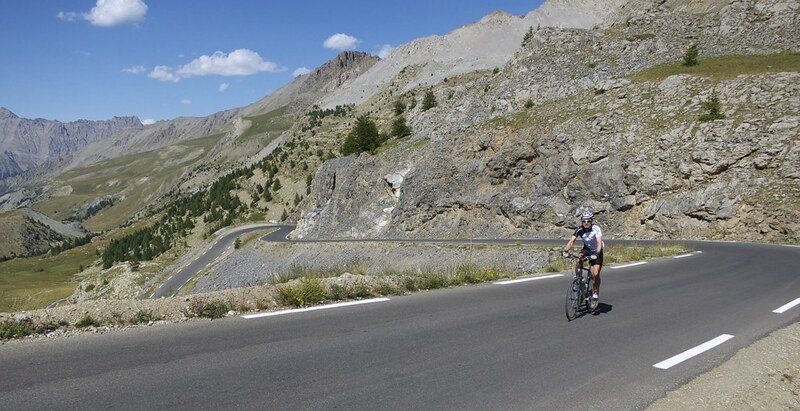 Road Openings/Closures: Col de la Bonette I believe usually opens mid June – give or take a couple of weeks. 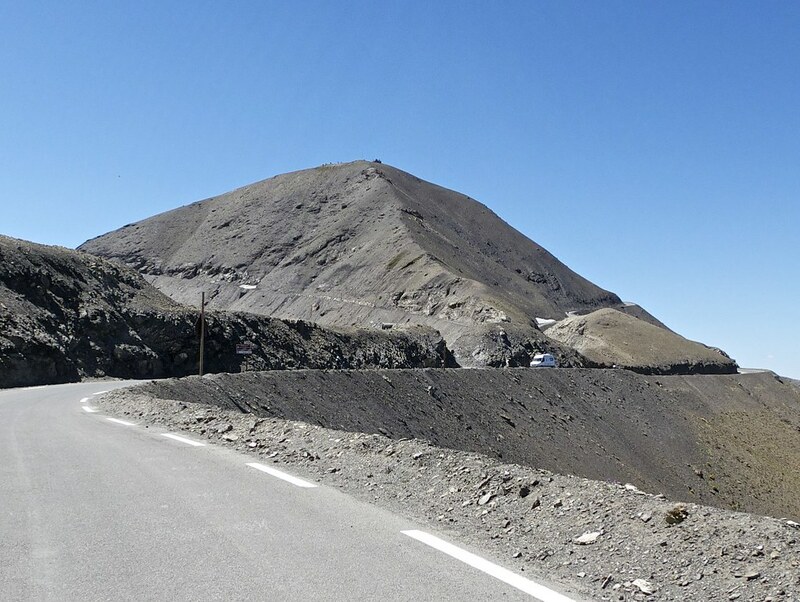 Note, in 2016, it is scheduled to be crossed on May 28th by the Giro d’Italia – the Col (2715m) not the Cime (2802m) – so there will be some early snow removal efforts. Alternatives: Both Allos and Cayolle should usually open a little sooner than Bonette, but not much. Mid-May give or take 2 weeks would be my guess. All three routes should be reliably open through September, with a decent chance in October. Official Department col open/closed map here. Tough choices here. This is why – if possible – an extra day in Barcelonnette is a good idea. 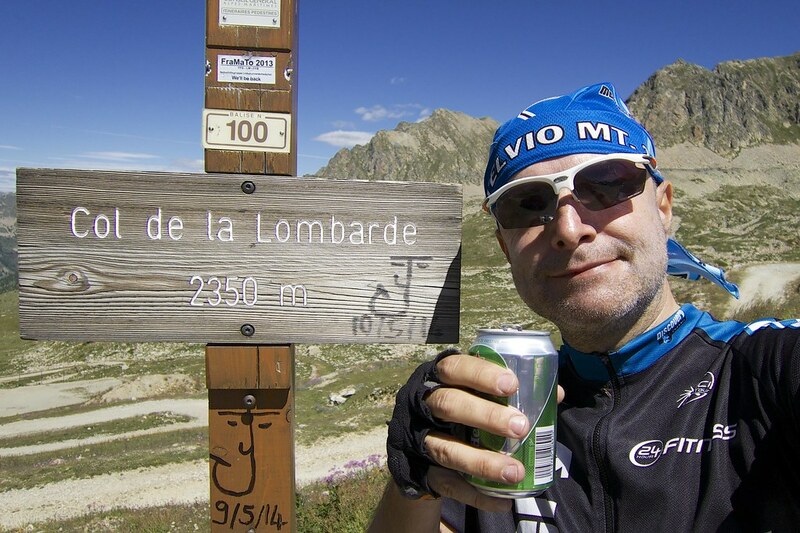 Hmm, I used my Allos beer photo in stage 5. Fortunately, I have a Lombarde beer photo. Cheers! Col de la Lombarde: I prefer climbing from Italy to France because italian side with tiny road is much more beautiful. French side is tough and little boring climb to ski resort Isola 2000. Last summer I did the Allos-Champs-Cayolle loop one day, then on the next day I did the superb loop from Beuil down the Gorges du Cians up the Col de la Sinne (highly recommended) and then up the east side of the Col de la Couillole. Your route of doing both gorges sounds great, but I really wanted to do the Sinne. The views from the top are breath-taking, and the 16km climb of the Couillole is much more rugged and steep than the easy 8 km of the west side. For amateurs of tiny roads cut into the cliff-face with little rock tunnels and villages perched high on pinnacles of rock, the Couillole east (and the Sinne from the pont de Cians) are a must. I agree that the Italian side of the Lombarda is the way to go. 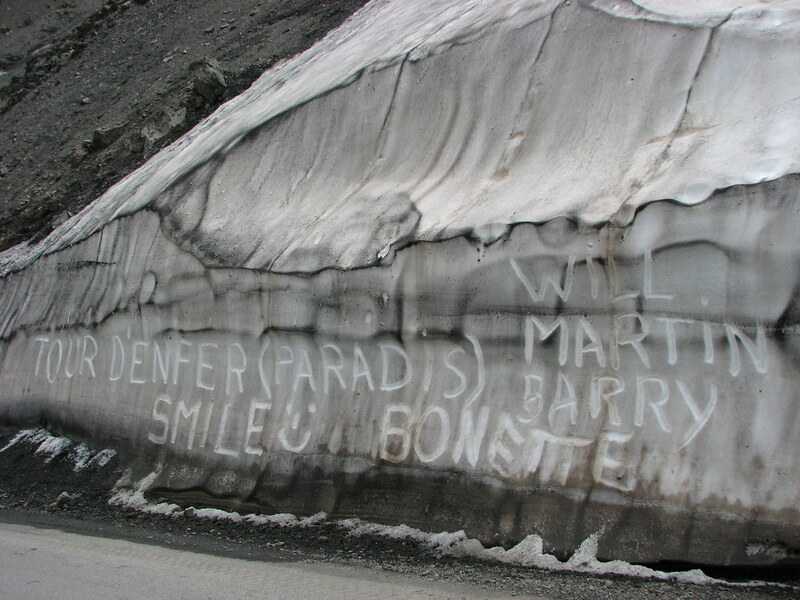 Several years ago I spent the night in the Santuario actually, and finished the climb the next morning (we had already done Sampeyre and Fauniera) before heading up the Bonette. Rates are very reasonable and the situation can’t be beat. I visited Santuario twice, but not overnight… nice experience. What a surface to Col de la Sinne, is it rideble on road bike? On michelin map is upper part signed like gravel road. Do you also know opposite east side? Couillole I have ridden from east too. It’s tough but nice climb. From col de la Moutière, a fairly rough dirt road connects back to the paved Bonnette road (maybe 3 km?). So a loop is possible (e.g. Jausiers, Bonnette, St-Dalmas-le-Selvage, Moutière, Bonnette, Jausiers). I liked Moutière a lot, very remote. 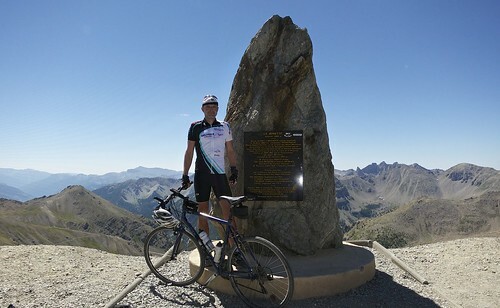 One man from our country has ridden on road bike Jausiers – Bonette – downhill south – Moutiere – gravel stretch to Restefond – Jausiers… and gravel part wasn’t problem in your opinion. If you has mtb, you can try gravel road leading down to Bayasse on Cayolle road. For cross bike is this road too much stony.